Dragon Blaze is a fun role-playing game with adorable visuals and an excellent weapon enhancing, leveling and skill system. Battles are fun, with allies or party members doing most of the attacking. You will be controlling your main hero to help your allies defeat enemies and boss monsters. Your main character’s class selection shouldn’t be ignored despite the fact that party members inflict maximum damage. Do you like attacking from a distance or are you more comfortable bashing enemies up close? Choose the right class that suits your temperament. There are 5 types of classes: Warrior, Mage, Rogue, Priest, Archer. However, you should also keep an eye on your character class’s stats like ATK, DEF and Difficulty. Some have an excellent ATK rate (4-5 stars) but may have a low DEF (2 stars). Select a character class that has balanced stats. I would recommend a Warrior or a Mage. Both classes have a decent ATK and excellent DEF stats. You can create up to three different characters. There are 5 slots of which 3 have been unlocked for you. You will need to spend rubies to unlock the other two. The character slots can be seen once you have created your first character. Tap on the Create a Character button if you want another character in the list. You can switch to a different character any time, but you will have to start from scratch. Try completing the first few levels with your first character and then choose second and third character to play the same levels. Notice the difference between their approach and how effective are they in dealing with enemies and then continue with the one that inflicts more damage than the other two. Friends not only assist you in defeating enemies, but also help you earn Friend Points (FPs), which can be used to summon new allies. You will need 30 friend points to summon an ally. Once you have collected 30 FPs, go to Shop > Summon and tap on the “Normal Ally” button to recruit a character. You don’t have to be signed in to your Facebook account to invite friends. You can invite and accept friend request right from the game’s “Friends” section. Tap on Friends > “Recommended” tab to get a list of friends. Tap on “Send Request” to invite random players to assist you in battle. 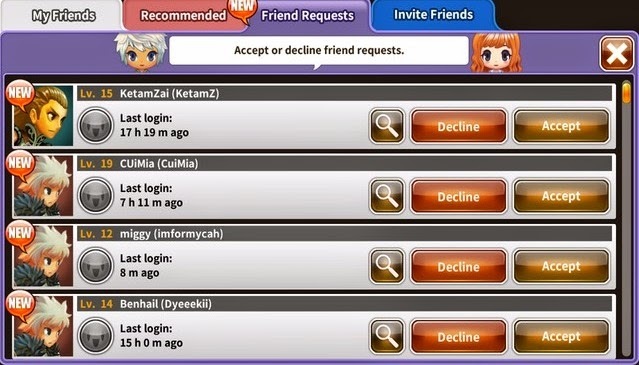 You can also go to the “Friend Requests” tab to accept friend requests sent by other players. The more friends you have, the more friend points you can earn. You earn 2 friend points when you “Select” a friend in the “My Friends” screen that appears just before battle. Tip: When selecting a friend to help in battle, choose a high-level player. When battling enemies, tap on your friend’s avatar pic at the top of the screen to summon him/her. Your friend’s character will join your party to help you defeat enemies for 60 seconds. Once the 60 second timer run out, there will be a cool-down time. You can use him again once the cool-down time gets over. 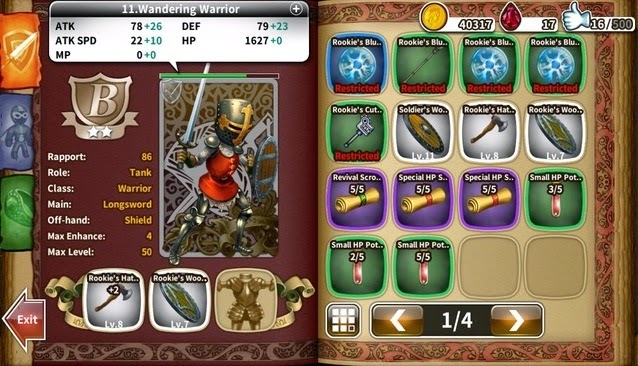 When battling monsters, ghouls, mermaids and sundry others, you will receive weapons, armor and other items. You won’t be able to use most of the items because they aren’t suitable with your character’s class. The “Restricted” weapons can be used to equip a suitable party member. 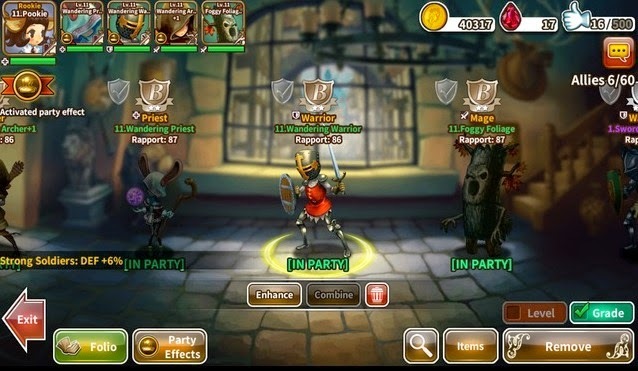 Just go to “Allies”, drag your finger on the screen to choose a party member (in this example, Warrior) who can wield those weapons. Now tap on “Items” located at the bottom-left corner of the screen. Drag and drop the longsword to the bottom weapon slot, just below the avatar pic of your party member. You now have equipped him with a longsword. Repeat the same procedure if you want to add other items that suits an ally’s class. Adding weapons and armor received in battle to its respective party member can make your party stronger. You can also enhance a party member’s weapons and armor if you receive a duplicate weapon or any other item that matches with a party member’s class. To enhance weapons, go to Allies and tap on the “Items” button at the bottom of the “Allies” screen. 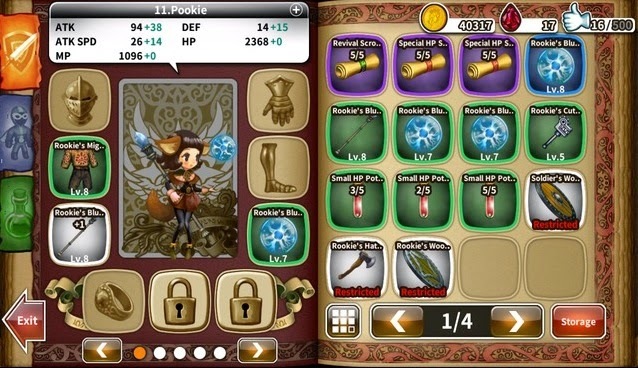 Next, tap on the main weapon below the party member avatar pic. Tap the Enhance button, now drag and drop the duplicate weapon or any other item that does not have the “Restricted” label to the empty slot just below the main weapon in the “Enhance Item” screen. You can use any item that does not have the “Restricted” label, but the success rate should be 100 percent to ensure a fusion success. A 50 percent rate has a lower chance of success. Normal Ally (Tip: Most Normal Allies are of no use and you shouldn’t replace your established party member with a normal ally. Use them to enhance a party member. Remember, party members cannot be used as materials). You can use any ally, but it’s recommended to use one with the same class type and grade. Also, make sure you the success rate is 100 percent as a 50 percent enhance success rate usually fails. Combining allies is tougher as the requirements are not easy to fulfill. 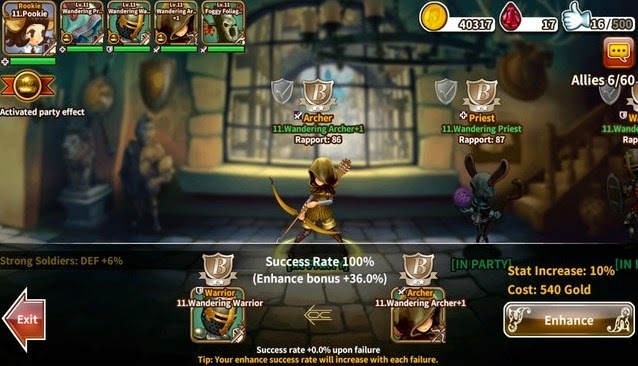 You will need two allies of the same grade (A, B or C) with 100 rapport and maximum enhance level. The combination process creates a new ally of the same grade, but at the cost of losing two allies of the same grade. Enhance your party member first and later you can combine once both allies of the same grade achieve max enhance level. 1. Check your mails frequently. Tap on the envelope icon at the top-right corner of the screen and then tap on Open > Claim to get your rewards, which could be anything from shoes, friend points, and gold, even ally tickets. 2. Enhance your main character’s key weapon, armor or shield regularly. Go to Inventory and tap on the weapon slot. Tap “Enhance” and choose a material that does not have a “Restricted” label. You can choose a low level weapon of the same type, shield or armor to enhance your current weapon. 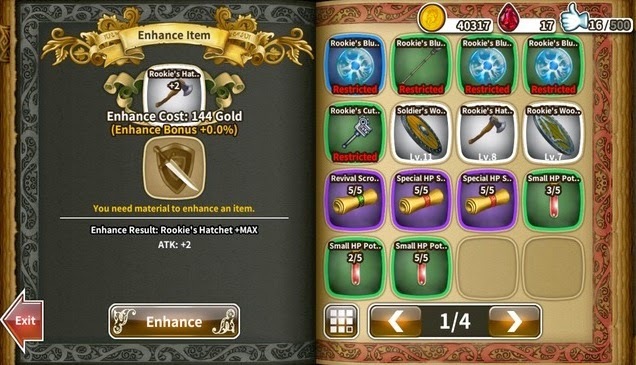 Drag and drop the item to the empty slot below the main weapon in the “Enhance Item” screen. 3. 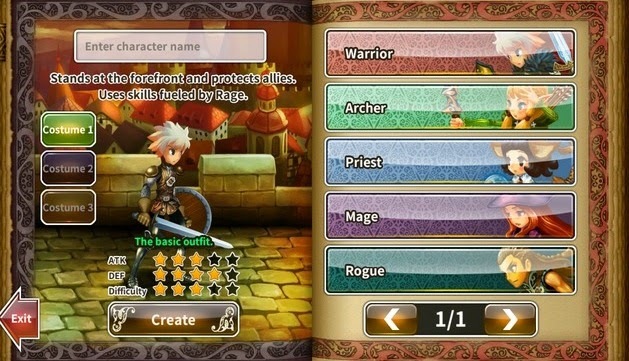 Your character and party members level-up as they fight more battles and complete missions. Reaching a certain level lets you learn a new skill. You earn skill points every time you level up your character. The skill points earned can be used to upgrade your character’s unlocked skill. 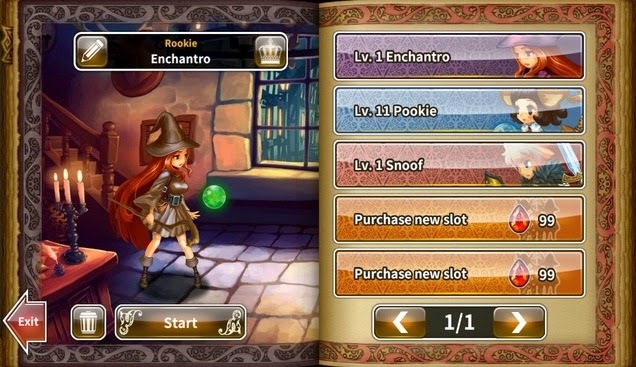 Play more levels, level-up and then use skill points to upgrade skills to make them more powerful. 4. You can also use Friend Points to summon a weapon in Dragon Blaze, armor or magical item. Go to Shop > Summon and tap on Normal Equipment to get a surprise weapon. You will need 15 Friend points to summon an item.